The purpose of pressure vessels is to store gases and liquids at pressure range different from ambient conditions. Selecting a pressure vessel for specific application requires understanding the internal pressure conditions that generate forces on the walls of the vessels that subsequently generate stress and deformation. A prolonged exposure of the vessel to extreme forces from the high pressurized fluid can affect the fatigue life through the development and growth of cracks, leading to catastrophic failure. As such, to maintain the safety and integrity of the pressure vessels in industrial plants is of a paramount importance, which is why, the design of these equipments are usually governed by ASME standards. While ASME code books provide theoretical permissible stress values, their practical application cannot be utilized to identify life cycle of the pressure vessels. In order to determine real stress values for life cycle calculation, it is required to crank Finite Element Analysis. In order to follow the standards, the ASME Boiler and Pressure Vessel Code (BPVC), Section VIII, Division 2, provides a set of alternative rules for selecting material, design fabrication, inspection and testing of pressure vessels subjected to an internal pressure loading that exceeds 15psi. The part 5 of the division 2 also mentions the utilization of finite element analysis to estimate useful life cycle of the vessel. The stress analysis approach using finite element analysis allows determining the actual stress concentration across the vessel geometry. However, this requires developing an accurate CAD model to represent actual pressure vessel and also applying accurate loading conditions. 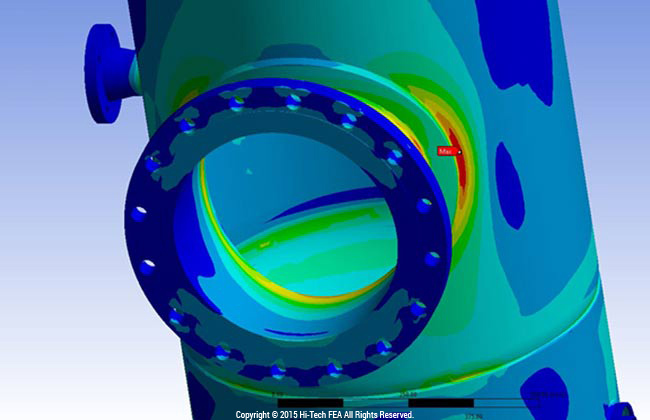 Once the stress values are simulated by the FEA solver, the effective stress amplitude can be calculated using the equation provided in ASME standards. The stress amplitude can then be utilized to calculate design number of cycles in accordance with Part 5 of the Division in ASME codes. The calculated allowable cycles can be compared with that of the predetermined design cycles to estimate actual fatigue life. In addition to the stress calculation in pressure vessels due to cyclic pressure loading, it is also important to consider the importance of welded joints in cases where the vessel is being transported to far off places. During transportation, the welded joints are often subjected to stresses resulting from inertia loading due to internal dynamic forces as well as forces acting from uneven road conditions. As such, weld fatigue analysis is also equally crucial in determining the actual life cycle of pressure vessels. This is accomplished using the Master S-N curve for welded joints and equations mentioned in ASME codes. Finite element approach provides the flexibility for manufacturers to reduce manufacturing costs by allowing optimization of wall thickness without interfering with the ASME safety standards. Prediction of the actual life cycle prior to manufacturing also helps in establishing warranties and service schedules. About Author : Bhaumik Dave is a Sr. FEA consultant at Hi-Tech FEA, an India based FEA service provider. He has applied his FEA expertise across several highly complex and big scale projects, consequently managing to seamlessly deliver as per the client requirements. How efficiently and quickly can a design engineer generate a valve assembly? Copyright © 2019 Hi-Tech FEA All Rights Reserved.